University of Pittsburgh Press, 9780822945574, 360pp. In early July 1899, an excavation team of paleontologists sponsored by Andrew Carnegie discovered the fossil remains in Wyoming of what was then the longest and largest dinosaur on record. Named after its benefactor, the Diplodocus carnegii—or Dippy, as it’s known today—was shipped to Pittsburgh and later mounted and unveiled at the Carnegie Museum of Natural History in 1907. 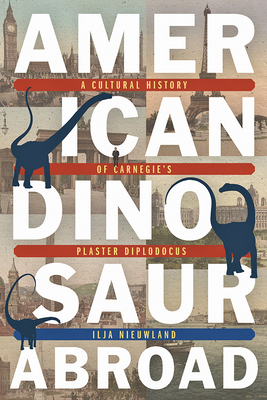 Carnegie’s pursuit of dinosaurs in the American West and the ensuing dinomania of the late nineteenth century coincided with his broader political ambitions to establish a lasting world peace and avoid further international conflict. An ardent philanthropist and patriot, Carnegie gifted his first plaster cast of Dippy to the British Museum at the behest of King Edward VII in 1902, an impulsive diplomatic gesture that would result in the donation of at least seven reproductions to museums across Europe and Latin America over the next decade, in England, Germany, France, Austria, Italy, Russia, Argentina, and Spain. In this largely untold history, Ilja Nieuwland explores the influence of Andrew Carnegie’s prized skeleton on European culture through the dissemination, reception, and agency of his plaster casts, revealing much about the social, political, cultural, and scientific context of the early twentieth century. Ilja Nieuwland is a historian of science – in particular paleontology – attached to the Huygens Institute of the Royal Netherlands Academy of Arts and Sciences in Amsterdam. "Diplodocus is a Jurassic icon, one of the largest and most impressive dinosaurs ever uncovered. But it is not just that. In this detailed, thoughtful exploration, Ilja Nieuwland follows the changing cultural significance of this famous dinosaur in its role as ambassador, celebrity, and scientific catalyst, revealing how a single, spectacular skeleton can spur broader changes in the process of science and appreciation for nature. Read this book and you'll never look at old bones the same way again."